When I think of the word “masterpiece”, I think of unforgettable albums like Abbey Road and Pet Sounds or great movies such as Pulp Fiction and 2001: A Space Odyssey. These “masterpieces” flow perfectly from song to song or scene to scene. They leave you thinking and make you watch/listen for years, maybe even for decades. Before listening to Marianas Trench’s sophomore album Masterpiece Theatre, you might think that frontman Josh Ramsay is being a little overconfident about himself, choosing to label his own album as a “masterpiece.” He says himself though, “but it’s tongue-in-cheek. And I’m not the kind of person that people would assume as being an egomaniac. I hope not, anyway.” Calling your own album a “masterpiece” aside,Masterpiece Theatre by Marianas Trench is an impressive pop-rock album. The entire album revolves around 3 songs: “Masterpiece Theatre I”, “Masterpiece Theatre II”, and “Masterpiece Theatre III”. All of these are standout tracks and are much different from the rest of the album. In between each of these tracks are memorable, foot tapping pop songs that you can never stop singing along to. Almost every song on the album could be a successful radio hit single. From the beginning, you can hear how great Josh Ramsay’s voice really is. After “Masterpiece Theatre I” begins “All to Myself”, which gives you a taste of what the whole entire album is like. 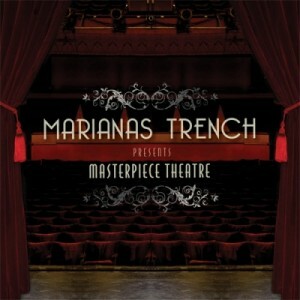 A majority of the songs on Masterpiece Theatre kick in immediately, with an intense guitar riff and verse as an intro. Then comes the chorus, followed by another verse, followed by a chorus transitioning into a breakdown, and then ending with a chorus. You’ll probably notice that this is almost the same structure as “Baby” by Justin Bieber, but I digress. One thing is certain though: all these songs have catchy choruses, which would make any teenage girl (or boy) start dancing and sing along. Some songs, however, such as “Beside You” and “Lover Dearest”, have a softer sound. The guitar riffs are replaced by acoustic guitar finger picking. The three songs that make up Masterpiece Theatre are quite different from the rest of the album, but are similar to each other. “Masterpiece Theatre I” begins the album with the sound of an orchestra tuning their wind instruments. This stages the beginning of the entire album, preparing the listener for a series of epic songs. “Masterpiece Theatre I” starts off lightly, but then gets much more intense. “Masterpiece Theatre III” is probably the defining song of Masterpiece Theatre. It samples each song from the entire album. At first listen, you won’t even notice it. All of the songs are not played exactly the same way, but seem to fit together perfectly. “Masterpiece Theatre III” is a great song by itself. There could not have been a better way to end an album. It gives a taste of each song, and summarizes the entire album, proving the talent of frontman Josh Ramsay. The whole entire structure of the album seems to be perfectly done. From “Masterpiece Theatre I” to “Masterpiece Theatre III”, every song flows together appropriately. Nevertheless, every album has its flaws. The one song I skip on occasion is “Good To You”. It’s a dreary piano ballad that just doesn’t seem to fit in with the rest of the album. The odd placement of “Masterpiece Theatre II” makes sense, but the track is obviously very different from the songs that surround it. However, I would not call this a defect. “Masterpiece Theatre II” gives the listener a break from the catchy pop songs, letting them catch a breath. It is also an impressive song in its own right. With a first look at Marianas Trench and their music, you may think that they’re just like any other pop rock boy-band you’ve seen before. This is ultimately quite true: their music is most definitely aimed at teenage girls. However, the three Masterpiece Theatre’s are more than that. Josh Ramsay seems to be able to reach any key when singing and knows how to write good pop songs that are not so generic. He knows what he is doing. Marianas Trench’s Masterpiece Theatre may not be a “masterpiece” in the actual sense of the word, but it does have the appropriate attributes to be one: good flow from song to song and a great lasting value.